Wearside League football between Silksworth CW (red) and Sunderland West End, played at Silksworth Recreation Park. Adam Storey put Silksworth ahead midway through the first-half, but goals from Brad Wilson and Barry Turton gave West End a half-time lead. Two second-half goals from Mark Robinson put the visitors firmly in control and they took the points, despite Harry Munday giving Silksworth some brief hope with a goal on 75 minutes. The 4-2 win moves Anthony Nelson’s side level on points with second-placed Wolviston and former Silksworth midfielder Clarke was full of praise for his side for securing the local bragging rights. 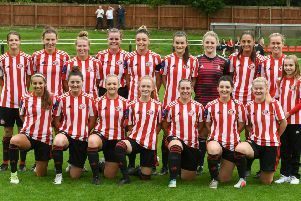 “It was a massive game because Silksworth are a very good side,” explained Clarke. “They are more than capable of taking points from the top six sides and they have done that already this season. “Other than the first 15 to 20 minutes, we dominated the game and were always in control. Silksworth coach Michael Curtis admitted that his side were beaten by the better side, but insisted that they would take the positives from the game. He said “We were good for 20 minutes, got the first goal and were well on top. “But then we gave two sloppy goals away and the difference between the two sides was that they took their chances and we didn’t. “That’s why they are where they are in the league. “We will take the positives and I don’t think we are too far away from being a good side. “They are a good side and we aren’t too far away from them. “We need to make small improvements and we will get there. “We are going in the right direction, but we have to get rid of that inconsistency. Hebburn Town Reserves continue to lead the way and stretched their lead at the top of the table to seven points with a 4-2 win at Gateshead Leam Rangers. Goals from Evan Peareth and Carl Taylor weren’t enough for the hosts as the Hornets took the points thanks to strikes from Adam Sharpe, Dylan Nesbitt, Josh Houghton and Shaun Reay. Davey Stevens got the only goal of the game to help Horden CW to a hard-earned win at Richmond Town and Matthew Metcalfe fired Windscale to a valuable three points with four goals in their 7-0 win over Coxhoe Athletic. Wolviston were knocked out of the Durham FA Trophy with a 4-0 defeat against Gateshead A. League rivals Harton and Westoe CW did progress as goals from Dan Nolan, Levi Collins, Jason Pressling and Grant Pressling and brace from Joe Turnbull helped them to a 6-1 win at North Riding League club Stockton West End. Two goals from David Parker and one each for Lee Hume and Declan Brown gave Darlington RA a 4-0 win against league rivals Annfield Plain in the TWR Shipowners Charity Cup. Ash Griffiths hit a brace and there were goals for Daniel Kent, Michael Connelly and Connor Lowes as Darlington Town also saw off league opposition with a 5-2 home win against Boldon CA. There were five different goalscorers for West Auckland Tuns as they ran out 5-2 winners against Washington AFC Reserves. Will Preston, Mason Steed, Bailey Brudhoe, Rhys Porter and Brian Bradley were amongst the goals for the Tuns. 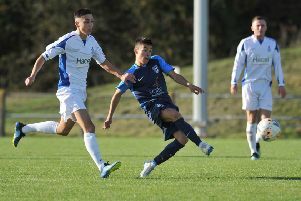 Hartlepool FC crashed out in Round One of the same competition against Durham United as two goals from Adam Watson and one each from Dan Mann and Dan Horabin gave the Durham and Wearside League Development club a surprise win at New Ferens Park.